Bottom Line: Well written poignant book telling an important story. Suffers slightly from a lack of cohesion and too many characters. Recommended for most public libraries. Would be a good companion to Persepolis by Satrapi. This book opens in terror with a pregnant imprisoned woman, blindfolded in the back of a van, being transported from where she is held as a political prison in post-revolution (late 1980s) Iran to a prison hospital while trying to hold her labor back until she arrives at the hospital. It's a heartbreaking scene and it sets the tone for this book, the focus of which is on the children left to be raised by relatives and friends as their parents are rounded up and imprisoned/tortured/executed by the Iranian Revolutionary Guard. First we see these children through the eyes of their caregivers who at once are grieving for the loved ones imprisoned and themselves sacrificing much to care for the little ones. And then we jump into the modern era, to see the children as young adults themselves involved in a new round of political protests, crackdowns, and imprisonments. It's a beautifully written book and a very timely story. In the last few years, I have found myself drawn more and more to stories from this region. However there are a lot of characters. And you have very minimal introductions to them and are plopped into their lives and expected to figure out how they relate to each other on your own. And they do all seem to relate to each other. This is almost but not quite a series of short stories or vignettes on life in Iran. Perhaps it would have been better as a series of unconnected short stories. At one point I was so distracted trying to figure out how people were connected that I was tempted to draw a flow chart. Adding to the disjointed feeling of the multiple characters is the multiple timelines. The story jumps back and forth between the 80s and 2009 and on. A character who was once a young child was then a young adult and then again we're reading of their parent as a a twenty-something. Perhaps this rather loose narrative flow was intentional to give the sort of disrupted feeling that the children and their parents felt when their lives were interrupted by imprisonment. But if I have to reach that hard for an explanation, it might be too much. It's a very good book and I could handle the plethora of characters or the back and forth timelines, but with them both it was just enough to keep this from being a great book. Haunting and beautiful though and I still recommend it. Just approach the book as a series of vignettes and don't worry too much about piecing it all together. Blood Between Queens by Barbara Kyle; Thornleigh (series) #5. Publishes April 30, 2013 by Kensington. 448 pages. Bottom Line: An enjoyable but not extraordinary Tudor-era novel focusing primarily on family dynamics and romantic intrigues. It would be a good summer read, choice for fans of the previous books, or for that person who has read EVERYTHING on the Tudors. Should be picked up by libraries who have the others in the series or for a browsing paperback collection. I downloaded a ebook review copy of this without realizing it was part of a series.While I was frustrated at the hints of backstory that were never fully explained, it did work as a standalone book. 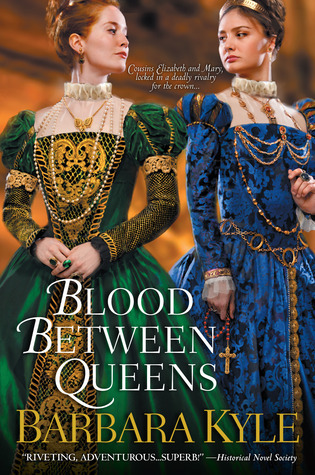 Blood Between Queens is the story of Justine, a young ward of an Elizabethan courtier and how she becomes entangled in the messy relations between Queen Elizabeth I and her cousin/rival/heir Queen Mary of Scots. Justine has been raised by a rival family from her own (think Hatfields and McCoys but in Elizabethan England) after her father's treason ruined her family. She alone knows he is not dead, but rather fled the country. But even she is surprised when he returns to the country and tries to enlist her help to overthrow Elizabeth and put Mary on the throne. 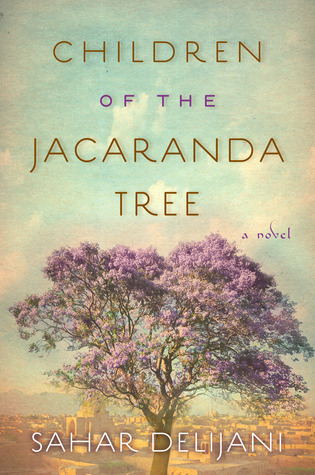 Beyond the political intrigues, Justine is torn between sympathy to her father and childhood Catholicism and love of the family that raised her, a nephew of whom she is betrothed to. Tough choices especially when she is sent to captive Mary's side as a companion and undercover agent for Elizabeth. The Tudor time is a familiar ground for novelists and this is a good addition to that collection. (Confession I've read much of that era and I'm not sure how I missed this series before.) It is full of historical details and the setting was richly portrayed. In fact at least once I read a detailed description of Elizabethan life (streets, houses, sounds, people, etc) with a feeling of deja vu for having read a similar scene a chapter or so before. It is engaging as a standalone and it will be a welcome next chapter to those who are enjoying the family's previous epistles. However it might not be the first book I recommend to someone looking for a Tudor-era novel. My primary complaint is that it was fairly predictable. Never once was I particularly surprised by a character's motivation or actions or any plot development. That said, I did enjoy the book and it had just enough of a plot to keep turning the pages primarily enjoying the characters and the settings. In the same shipment that I received Relish by Lucy Knisley, I also received Jerusalem: A Family Portrait by Boaz Yakin and Nick Bertozzi. (First Second, will publish 4/16/13, 381 pages). Confession: I don't know much about the history of Israel/Palestine in the time period covered by this book (1940-1948). 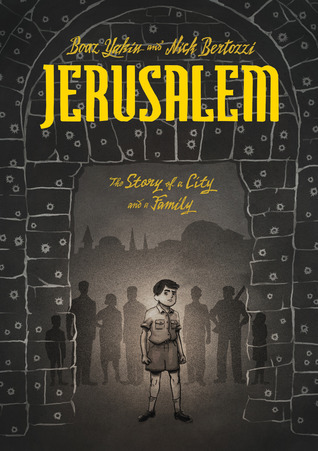 Fortunately the author includes an introduction to both the historical context, the city of Jerusalem, and the families portrayed. This was invaluable to me and I flipped back to it numerous times. Unfortunately the reason I kept flipping back to the family tree is I had trouble keeping two of the brothers straight. Additionally several side characters were introduced with so little fanfare that when they reappeared, I had forgotten them and had to refresh my memory. The jumbling of characters (there were a lot of characters) is my main complaint about this book. The artwork is spot on (other than the two brothers I couldn't tell apart). The black and white palette and harsh lines are perfect for a city at war. Primarily told through smaller (6 to a page) panels, this book packs a lot of action into it's pages, but does occasionally go to larger panels for dramatic impact. Excellently done entirely with the artwork. Text and artwork complement each other nicely. The story is doubly fascinating, both the story of a time of extreme unrest in an unstable region and that of the two families trying to survive in it. Other than popping over to a few wikipedia entries (which I always do because I'm rather a nerd), I was completely engrossed in this book. I read the entire thing in two settings. I would have liked an author's note comparing the fiction of the family to his real family, but without one I presume the family story is primarily fictional. That makes it no less compelling a read. 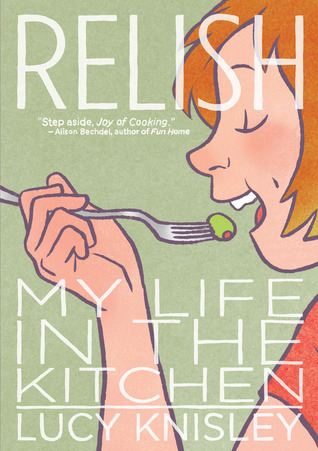 I received a copy of Relish: My Life in the Kitchen by Lucy Knisley a few months ago. (First Second, April 2013, 174 pages). While I eagerly devoured (expect many more food puns in this review) the book, I saved the review for this week's #fridayreads because this delicious graphic novel released this week. Bottom Line: Delicious book. Should be in all medium and larger sized libraries who collect adult graphic novels. Would recommend for anyone who watches the food channel, Anthony Bourdain and/or is a "foodie". Food is an integral part of our lives. It's tempting to start this review with stories of my own food culture, dishes cooked with families, and the flavors that always take me to a certain place and time. We could all spend days reminiscing in this way. And that is what this graphic novel is, a large reminiscence, a life told through food. But while I grew up with good but traditional cooks in a Southern/Midwestern atmosphere, Lucy Knisley grew up with gourmet cooks in the middle of a New York food renaissance. This is the story of both a recognizable middle class childhood (divorced parents, travel, school, friends), but also of a lot of different foods. The tales of childhood and young adult transitions are sweet without being cloying, substantial enough to fill you up, but not heavy enough to way you down in introspection like more literary memoirs. Instead what you will remember as you walk away from this book is the food. After reading this I added about 12 dishes to my "to cook" list. Besides descriptions of the dishes she ate, she includes cooking tips and handily illustrated recipes. Immediately before reading this my (future) mother-in-law and I tried a sushi recipe that we found on pinterest. It worked but not perfectly and thanks to the sushi tips in this book, I think I know what we did wrong. Let me have one more tortured food metaphor. This book is a perfect summer picnic meal: filling, nutritious (helpful recipes! ), memorable and fun. If you want a heavy feast of a graphic novel full of food for thought, try Maus. But when you just want a really good read without deep heavy issues, Relish hits the spot. I can't decide if I'm going to keep, pass along, or donate my copy. And I can't decide if I want to shelve it with graphic novels or cookbooks (or memoirs).